A couple minutes after liftoff on Oct. 11, a Soyuz rocket failed, sending the two astronauts aboard plummeting back to Earth and prompting a Russian investigation into what went wrong. The Russian space agency, Roscosmos, initial report from its investigation into the failed Oct. 11 Soyuz crew launch should be complete by the end of this week, the agency announced in a statement released yesterday (Oct. 17). The agency's head of human spaceflight, cosmonaut Sergei Krikalev, also said in a news conference yesterday that Roscosmos will not launch another crewed flight until three uncrewed launches are successful and the investigation's findings have been addressed. The Oct. 11 launch was aborted a couple minutes after liftoff because of an issue with booster separation, sending the two astronauts on board plummeting back to Earth. Roscosmos already had five Soyuz launches scheduled to take place before the next crewed launch: a cargo delivery to the International Space Station on Oct. 30 from Baikonur Cosmodrome, Kazakhstan; a weather satellite launch on Nov. 6 from Kourou, French Guiana; an Egyptian Earth-observing satellite launch on Nov. 22 from Baikonur; a navigation satellite launch sometime in November from Plesetsk Cosmodrome in Russia; and a launch for a pair of European satellites on Dec. 14 from Kourou. "The confirmations will be more than enough to put the next crew in space," Krikalev said of those launches, according to TASS. There are several different varieties of the Soyuz rocket. Only the Soyuz-FG model is certified to carry humans; that is the model that failed on Oct. 11. It would be used during the planned Dec. 19 launch that would next carry astronauts to the space station. Several of the upcoming uncrewed launches are assigned to Soyuz 2-1b models. 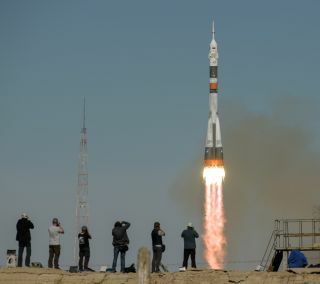 Throughout the launch-failure incident, NASA personnel, including astronaut Nick Hague, who was aboard the failed launch, and agency Administrator Jim Bridenstine, have expressed confidence that Roscosmos can investigate and address the cause of the launch abort and that U.S. astronauts will be back aboard Soyuz vehicles soon. Officials have also emphasized that the escape system worked flawlessly, despite not having been used since 1983, carrying Hague and his Russian counterpart, Alexey Ovchinin, to safety.